See MAIL ORDER page for prices. Johnny Rench is currently DJing on Somer Valley FM radio twice a week. The Raydiators recorded a BBC session for Tom Robinson on 6 Music - 13/11/09. The Raydiators also had their tune 'Gloria' played on Radio 2 - 25/11/09. A progressive reggae / dub / rocksteady experiment est. 2008. A live band that have recently been into the studio to record some of their own original material. The results of which are now available on two 12" vinyl singles. The Raydiators are a 6 piece line up (plus guests) with Johnny on bass, Petey C (decks, sax & melodica), Mullins on guitar, Shane 'Solid' Brimble (drums & vocals), Jake (guitar), and Rohan Tarry (flute, sax & vocals). 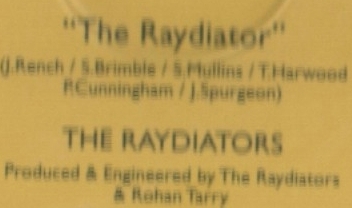 The Raydiators are the Somerset arm of Pop-A-Top Records. The group are an evolving progression on from The Pop-A-Top Allstars. They gig in and around the place with their set of original tunes (and the occasional cover!) wherever they can. See Events page for gig dates. Johnny Rench has been involved in quite a few of the labels releases. He appeared on The Erin Bardwell Collective Volume 1 - the labels debut release back in 2003 - playing drums on three tracks, double bass on one tune, and even sang lead vocal on I'm Bored. He then produced a versions compilation EP of said CD in 2005 entitled Man Cool Rides Again. This EP also featured Tom 'The Captain' Harwood (a future Raydiators member). Johnny has two solo tracks on this CD release. The 2006 The Erin Bardwell Collective Volume 2 and 2007s Earth Scorchers comp feature Johnny on bass and double bass on selected tracks. Johnny Rench also owns and runs the 'Shocks Of Mighty Sound System'. One of its bass bins currently doubles up as Johnny's bass amp in his latest band The Raydiators. In fact The Raydiators sometimes play through the whole sound system at gigs. For that big fat bass sound! Ideal at a reggae concert. Johnny Rench is a producer, solo artist, and musician for Pop-A-Top Records. Johnny's path into music began a long time ago. He has learnt how to play many instruments over the years including drums, bass, trumpet and guitar. One of his previous bands he was in was The Casswells, who recorded an album for the 'Vinyl Japan' label back in the 90's. The Casswells featured singer / guitarist / songwriter Paul Towler who years later would help out with Pop-A-Top artwork. Johnny Rench was lead singer in The More Specials from 1999 - 2005. At the tale end of 2005 he released his solo 7" vinyl single You're The One (PAT004). Recorded in Bristol with producer Rohan Tarry, the B side Good Lovin' (by The Pop-A-Top Allstars) soon received Radio 1 airplay on the Steve Lamacq show (March 2006). The first Pop-A-Top recording to get national airplay! See 'Releases' page for more info. For live appearances and DJ sets see Events page for the latest.